The official Japanese YouTube channel revealed a new card as part of its weekly roundup, a Megacolony Common from V-Extra Booster 01: The Destructive Roar, Burner Ant. Like Nasty Smog, Burner Ant follows one of Megacolony's new themes of manipulating the opponent's rearguards in the same column as itself. Burner can essentially retire a rearguard for the cost of resting itself, by moving a front row attacker to the circle behind the opponent's vanguard, or force the opponent to intercept by moving it behind another attacker. Choosing to use its second skill shifts that cost to a discard, but needs to be used carefully; considering that Megacolony now has a pattern of using discard costs and self retiring for its effects, stacking them recklessly will deplete the hand faster than you can replenish it and leave you exposed. One way around this is to use the clan's Protect Gift to pay the costs, utilizing the extra cards offensively rather than defensively. Being an 8k, Burner actually has the lowest base power of any grade 2 in Standard. This can be offset with Phantom Black, Butterfly Officer, and/or his own power bonuses, though each come at a -1. The card also synergizes with the aforementioned Smog by relocating rearguards to the same column as Smog, actually denying the opponent their intercept and keeping them from standing that back row unit. 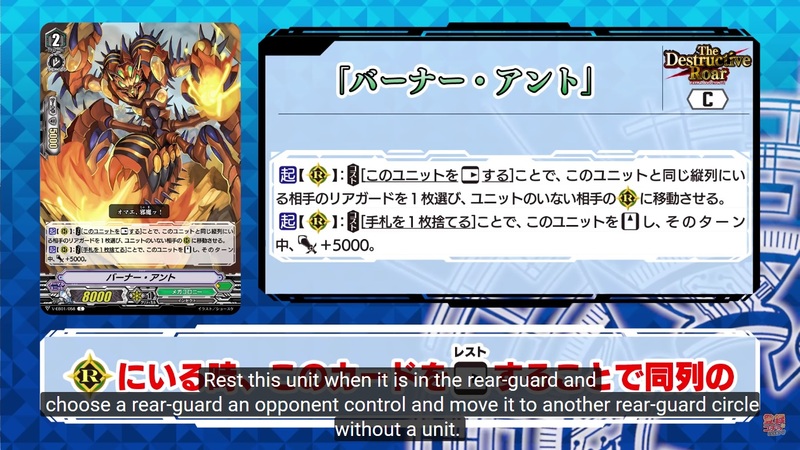 The episode also confirms that Bushiroad's official translation of Tachikaze's unique mechanic Busou Gauge is "Equip Gauge," rather than Armament or Armed Gauge. Last week's YouTube exclusive was Satanic Middleguard.